It was a pretty October evening in Hyderabad. 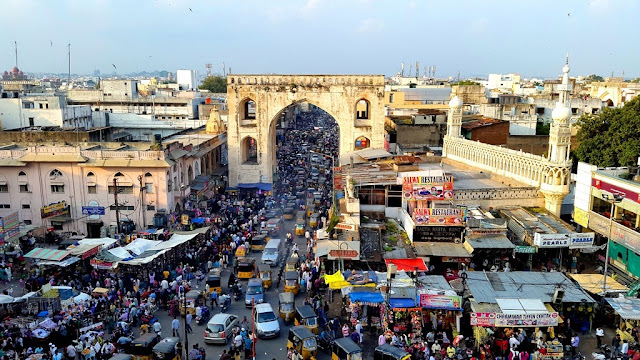 I sat in the car that was wading through the bustling crowds of narrow Hyderabad streets. I was impatient, thrilled and nervous. I was about to have my first encounter with the giant of Indian architecture – Charminar. I had read a lot about the History of Charminar, hence I was very much excited about visiting Charminar. As the car took a turn towards the Laad Bazaar, my heart skipped a beat. 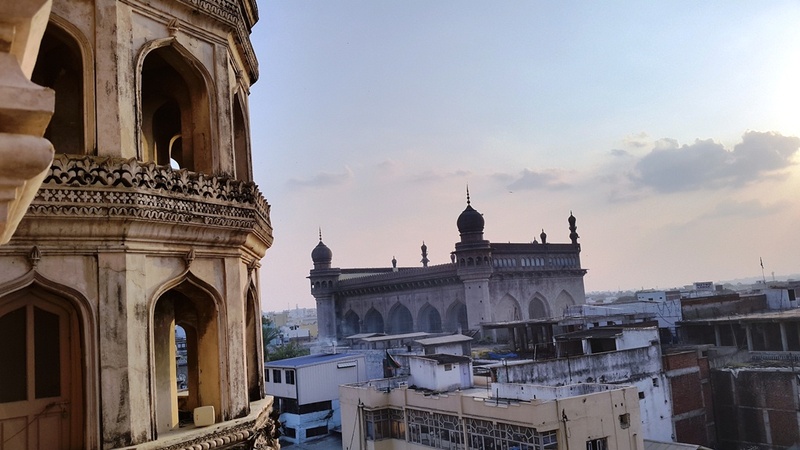 In the distance I saw the minarets of Charminar. I couldn’t help but exclaim “Charminar!” My driver turned back and gave me a proud smile. Soon he dropped me into an ocean of people who were in the hustle and bustle of their daily business. I slowly walked towards Charminar avoiding the bikes and auto rikshas. 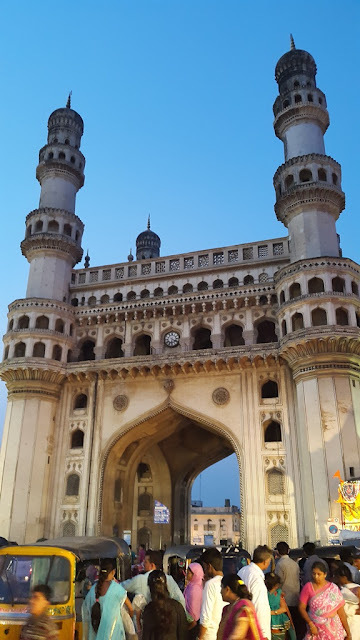 I took deep breaths as I walked towards Charminar. It is not emotionally easy for a history buff like me to stand eye to eye in front of a living piece of history. My head started recounting the facts as I stood near one of the four huge arches. 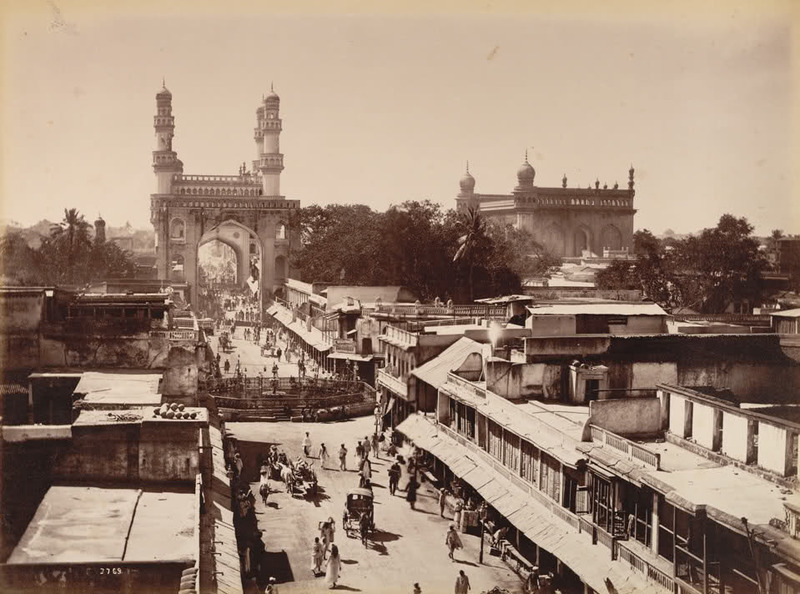 The history of Charminar is as old as the history of Hyderabad itself. Charminar was built in 1591 under the patronage of Muhammad Quli Qutb Shah – the fifth sultan of Qutb Shahi dynasty of Golkonda. The sultan wanted to shift the capital of his kingdom from the congested Golkonda fort to a brand new city. Charminar is said to be the first construction in the city around which the new capital grew. There are also other theories about the construction Charminar – the prominent one is that the Sultan constructed it as an offering to God for relieving his people from the deadly epidemic plague. Another, but not so authentic story says that Charminar stands on the place where the Sultan first saw his future wife Bagmati. 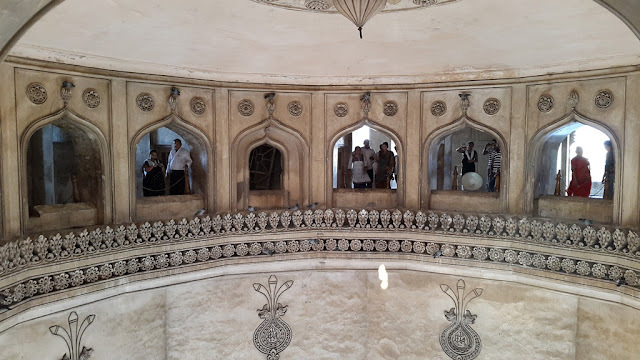 Thinking about these legends, I walked towards the fountain under the central dome of Charminar. 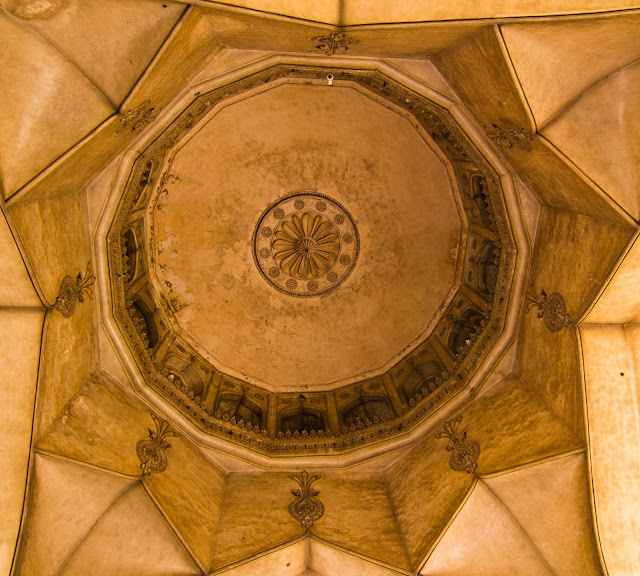 As I looked up, I saw a beautiful flower stucco work on the top of the roof and the traditional Alam symbols on the walls of the arches. 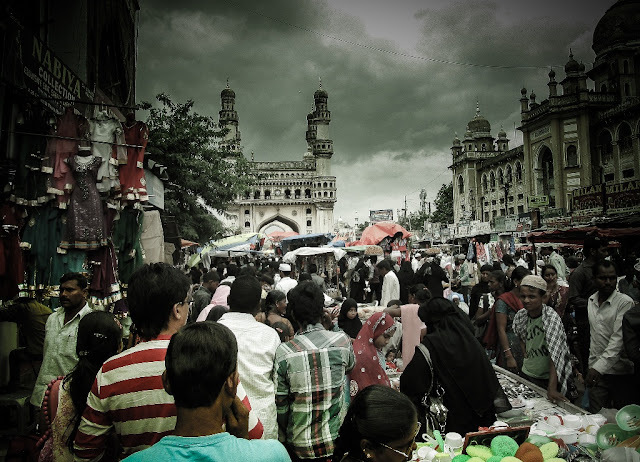 Charminar is built in four stories and tourists are allowed to climb up to the first level. Hence I joined the queue near the small opening that lead to the narrow winding stairs. Looking at the crowd waiting to enter the monument, I was afraid that a stampede may happen on the stairs. However, I waited patiently at the end of the moderately sized queue of perky youngsters, noisy school kids and austere elder couples. I was totally unaware of the drama that was about to unfold! As I reached near the door and handed over my ticket to a lady guard, she gave me grave look. “Are you alone?” her question was so shady, that I let out a nervous “yes”. “Step out of the queue please.” She told me and continued letting other people in. I was astonished and offended. What did I do wrong? For me it was a no way in! I asked the guard who was standing nearby who has been witnessing the whole proceeding. He replied in Hindi with heavy Hyderabadi accent. My face turned into a question mark and stared at him. I knew I looked like a nomad. I thought I looked like a happy nomad, not a depressed nomad. Panic struck me. What if this is not a joke? What if they really don’t allow me go up? 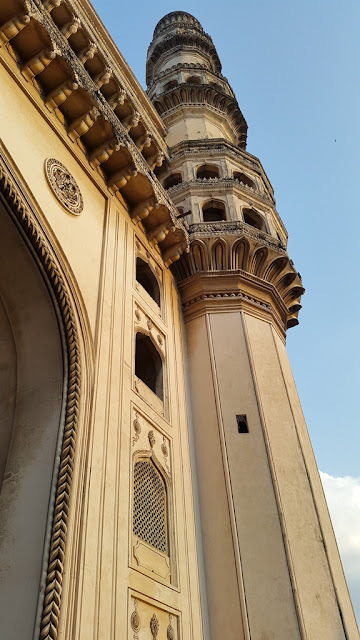 I came this close to Charminar and cannot make it to the first floor? Now, that would be a regret adorns the top most position in my list. I composed myself as the traveler gene took charge of me. I went an inquired the guide about what could be done. I convinced him that I was in the city for a business trip (I indeed was!) and had no plan to kill myself at a monument that I adore. He suggested talking to the officer in the ticket counter and if he allows, I can go up. At the ticket counter I repeated. “My Purpose of visit - Pleasure not suicide” The officer asked me to leave my original ID card with him – probably if I really did suicide, it would help him identify the corpse. I thanked him for his optimism and trust and ran towards the entrance. 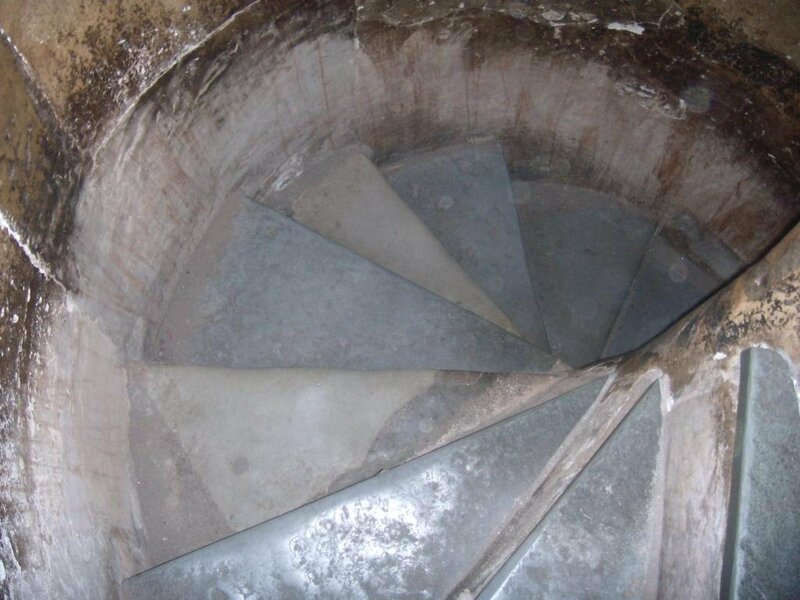 In no time, I was climbing those winding stairs, fearing that the officer might change his mind! As I reached the first floor and got the first glimpse of the view around, I knew the pain was worth taking. Viewing Charminar from outside is one thing and being inside it is entirely another thing. I moved towards the inner circular balcony of the first floor. There were small arched windows around the inner circle, which is adorned with beautiful floral patterns. People who were busy clicking the photos seemed to be oblivious of the great feeling of standing at the same place as the Sultans and great men once stood. I relished it however. These stucco works are the epitome of Indo-Islamic and Persian style. I wished people appreciated it and learned more about it. 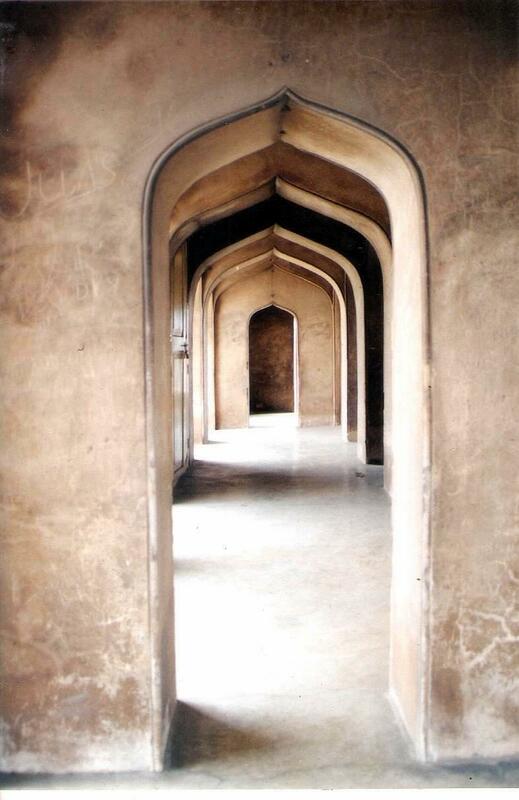 "Inside Charminar 1" by Karthik.natarajan - Own work. Licensed under CC BY-SA 3.0 via Wikimedia Commons. “Are you alone?” -I heard the sound behind me and I was getting ready to throw in my key phrase of the evening. To my surprise, the elderly security guard took no interest in me killing myself or not, but he offered to explain me about Charminar. I say yes. He took me towards the outside balcony and showed the Laad Bazaar, which is famous for bangles and peals. 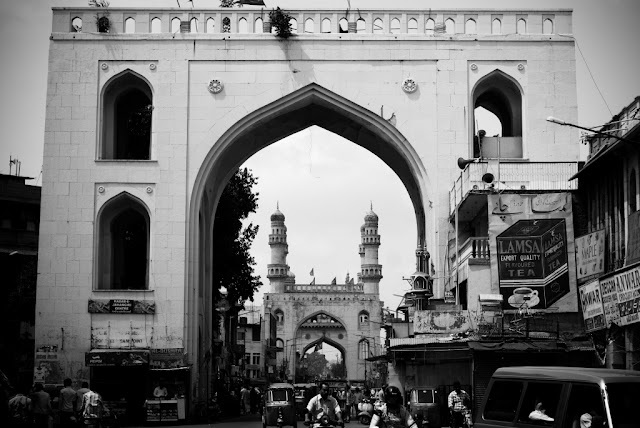 He also showed the “Char Kamaan” - four massive arched gateways to the Charminar. I remembered reading in the book “Charminar – the untold story” that the sultan Muhammad Quli Qutb Shah wanted a new city that is “unequaled in the world and in exact replica of paradise itself”. His prime minister Mir Momin took this challenge. All the essential features of the Islamic heaven depicted in the holy text Quran were incorporated into the design of Hyderabad. According to Quran, there is not just one paradise; there is a hierarchy of Paradises. The design of Hyderabad also incorporates two gardens symbolizes those paradises. 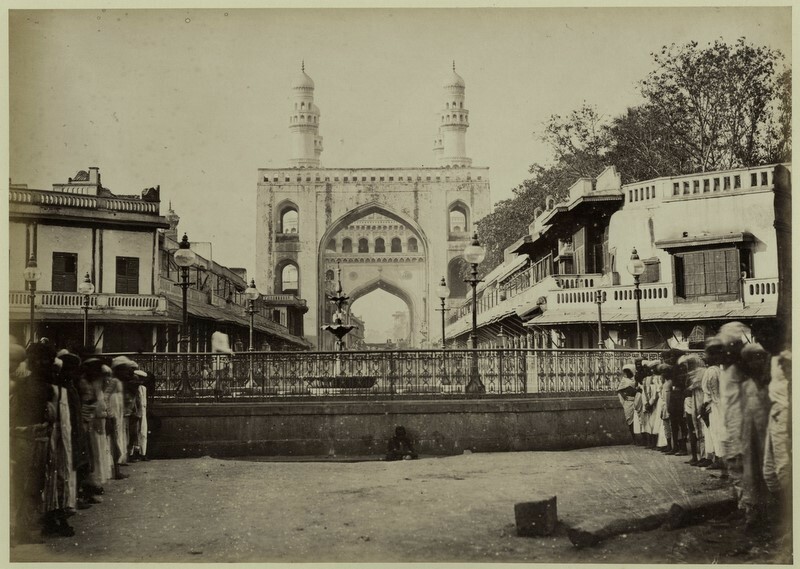 One is built around the Charminar and the other is around the Char-su-ka Houz - the royal fountain guarded by the Char Kaman. Char-su-ka Houz is located about 76 meters north of Charminar. From this fountain, four water channels radiated in four directions, which represent the Quranic heaven from which four streams of pure water, milk, honey and wine flows. There were also two trees planted on either sides of Char-su-ka Houz, one was beetle and another coconut representing the heavenly trees of Sidr and Talh. Still a dilapidated fountain present at the spot where original Char-su-ka Houz stood, which is now called Gulzar Houz. The Char Kaman also is symbolic of the Quaranic heaven. Two of them represent the Quranic Pleasures. One is towards the east known as Naquar-Khanae-Shahi (means "House of the Royal Drums”) where musicians used to play Shehnai and the beautiful maidens used to sing. Towards the west was the palace area, guarded by the western arch named Daulat-Khana-e-Ali (the "Gateway of the Royal Residence”). In the days of Qutb Shahi dynasty a large tapestry of gold cloth, hung down from this arch that separated the royal residences from public. Two other gates stood over the main north south-axis of the city - the Machli Kaman (Fish Gate) where a fish used to be hung in the morning during the Qutb Shahi rule. Urban legends says that the Sultan believed that it is a good omen to see the fish in the morning. The second gate is Char Minar Kaman which represent the wall which according to Holy Quran encloses the abode of the blessed. the ourist who comes to visit Charminar seldom told about the history of Charminar and such a legend behind it's architecture. As I was lost in thought, the guard showed me the Makkah Masjid. Makkah Masjid is not as old as the Charminar; however it is a marvelous architectural creation. More than the beauty of it, it has a mystic look and feel. 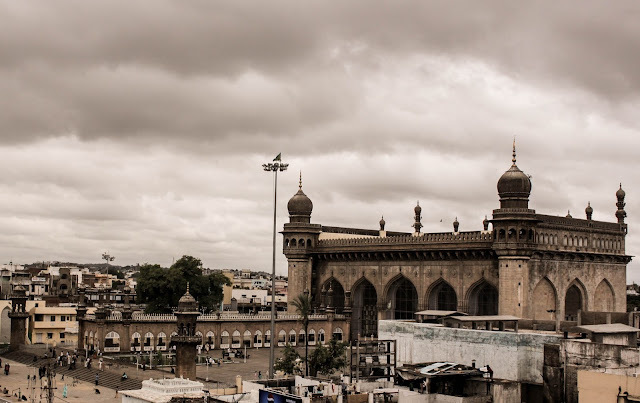 As I stood there watching Makkah Masjid from the top of the Charminar, a strange feeling of calmness came over me. It might be the call for Maghrib – the evening prayer - or the flock of pigeons flew around the masjid in the beautiful evening sky that created the mystic atmosphere. The guard enriched me with further stories and legends about the Charminar. It is believed that there is an underground secret tunnel that connects the Charminar and the Golgonda fort. No one has explored it in the recent times hence it still remains as an urban legend. I looked at the busy street below. Some say India is too crowded and they feel chocked walking down the Indian streets. For me chaos is India. If you want to really know India, get down into that chaos and walk in midst of people who thrive with life and energy. As you walk, look at the faces of people - weary with toil- yet rich with an intriguing life story. Guard asked me to follow him to the internal circular balcony of Charminar, which open to the central piazza. He continued his narrative. 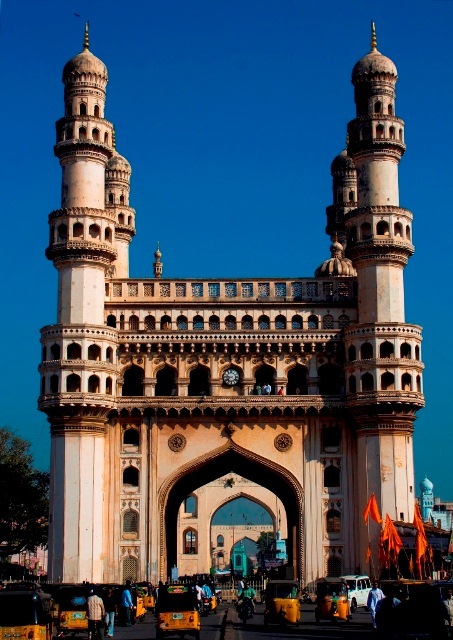 “Charminar was built from granite, lime and mortar that were available locally. However the architects and stucco work artist were brought from Persia and Turkey. You would find only floral and geometric patterns as depicting animals and humans in art work is prohibited by Islam religion. However they say there is a very queer exception to this rule. There seems to be something like a cat’s face embedded into the stucco works, but no one knows for sure. 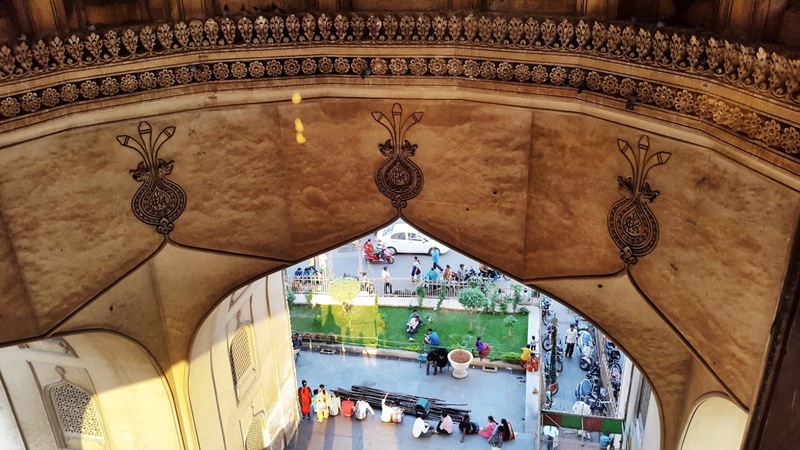 As Charminar was built to celebrate the riddance of plague –a disease spread by rats – it is not unlikely that a cat face appear among the decorations. I was quite overwhelmed with such a great deal of information. At the same time I felt quite ashamed to know so little about the monuments in India. Being an Indian I must take pride in them, understand their historic value and be able to explain it to anyone who likes to know the legacy of India. Dusk was coming over the vista of old building around Charminar. It was time for me to leave. I tried to offer some money to the guard who helped me the whole evening. But with a fatherly smile on his face he denied it and asked me to use the money to buy some bangles from Laad Bazaar. My heart was filled with warmth, amidst all negativity and hostility in world, such people constantly reminds us that there is still hope in humanity. I collected my identity card from the ticket counter and the gentleman inside the counter was happy that I came down alive! Reference: Pieper, Jan. "Hyderabad: A Qur'anic Paradise in Architectural Metaphors"
which camera you have used to curate your images, they are oretty cool.